Welcome: We are travelling a bit further afield to find courses where leads are not required as Rusty and Grace like to stretch their legs a bit. 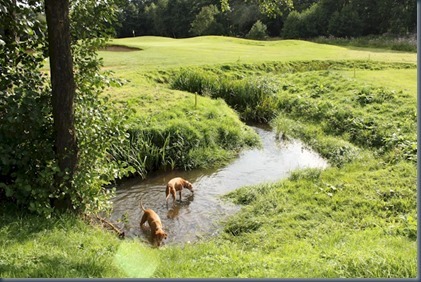 While Surrey’s Merrist Wood does allow off-lead, they are very keen on keeping dogs “under control”. They reiterated that concern a couple of times and they have a marshal that patrols the grounds (he passed us twice) to ensure that everyone is keeping to the club protocols. 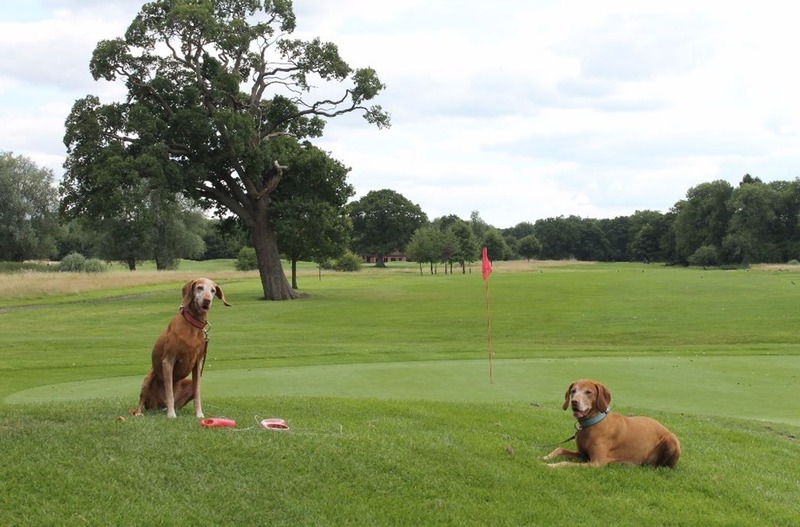 We always start Rusty and Grace on lead for the first couple holes to get them oriented, settled down and to burn a bit of energy. Wildlife: We kept them on lead a bit longer this time not just because of concern about tight control, but also there is quite a bit a wildlife which was all too tempting – a big flock of Egyptian geese, plenty of pheasants and of course the ubiquitous rabbits. Walk: Probably the flattest course we have played in the UK. Only a few minor hillocks to climb. But it what it lacks in elevation is makes up for in sheer distance at nearly 7,000 yards. The hazards do rise above the ground, but rather sink deeply into it. Merrist Wood has 80 sand bunkers (yes, I counted). That’s more bunkers than par. Many of them with quite steep exits. Water: All that sand doesn’t mean that Merrist Wood is a desert. There’s plenty of water for the dogs. But you can have too much of a good thing. Water hazards are generally a good thing for the dogs. A chance for a drink (see photo below) and they always enjoy exploring the reeds which directs their curiosity away from the course and other golfers. Rusty and Grace might have gotten their fill of drinking and cooling off a bit, but it did impose a few extra challenges for Lori’s and my precision (and we did lose a few balls into the drink). 14 of the 18 holes have water hazards including 5 holes with lakes (Hole 17 is 100 metres across directly in front of the green). Wind Down: We are finding out that a bit of advance research is required for finding an accompanying doggie pub after our rounds. We like to golf late on a Sunday when the courses are less crowded (so fewer people to be bothered by having dogs around). But that means finishing around sunset between 7 and 8. Well, lots of pub kitchens close at 7:00 pm on a Sunday. So finding a pub that (a) is dog friendly, (b) has a kitchen open to 8:00 or later, and (c) is close to the course can be a bit of a confining filter. Fortunately, Ye Old Ship Inn in Guildford ticked the boxes and we had a lovely meal. Their main event is their homemade pizzas baked in their brick oven which are as good as you will find anywhere (and Grace loves the pizza crusts). Lori opted for the lasagna which was a sizeable serving, very juicy (I hate dry lasagna), cheesy (I love cheesy lasagna) and meaty. The pub has lots of casual table spread around and the dogs are welcome everywhere so you don’t have to be confined to a limited area (some pubs have a couple tables by the bar or outside where dogs are welcome, but the bulk of their dining area tables are off limits to pups).